Farmyard Bingo is a cute and quirky gaming site launched in 2015, using the Dragonfish software. As such you know you’re in for an incredible combination of games and bonuses and we at Mobile Bingo Bonuses are here to tell you all about it. Whether you’re at home on the couch or you’re out and about, you can access Farmyard Bingo on your desktop, mobile and tablet devices. Add in the fact that they offer a huge range of games including table games, slots, scratch cards, progressive jackpots and of course bingo; then you’ll soon realise you have hours of gaming fun ahead of you. For the bingo fans you can play 90 ball, 75 ball and 5 line bingo. Registering is easy and once you’re a new roomie at Farmyard Bingo, you’ll automatically receive a deposit bonus when funding your account. This is a welcome from the site and the ideal way to test out a number of games. 3rd deposit, 100% bonus up to £100 (Code THREE). 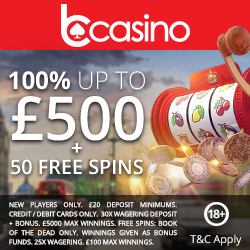 If you were to deposit a minimum £10 on each occasion, then you’ll walk away with £55 extra which when added with the depositing credit totals £85. 150% Bonus: Funded players only. Bonus available only on second deposit. Use code TWO. Minimum deposit is £10. Maximum bonus is £150. Withdrawal restrictions apply: wagering 4x bonus & 4x deposit. Bonus valid for bingo games only. 100% Bonus: Funded players only. Bonus available only on third deposit. Use code THREE. Minimum deposit is £10. Maximum bonus is £100. Withdrawal restrictions apply: wagering 4x bonus & 4x deposit. Bonus valid for bingo games only. It’s not just the new players who get the bonuses, because from the 4th deposit onwards you can enjoy a 50% reload bonus. The bonus is for deposits between £10 and £100 and means you’ll have extra credit, which can only increase your chances of a jackpot win. Most of us love telling our friends about the great new things in our lives, so why not tell them about Farmyard Bingo. For each of your friends who register and deposits, you’ll receive an extra £10 bingo balance into your account. There is a limit on the number of referrals each month, but you’ll still have a lot of extra gaming time. From the moment you register with Farmyard Bingo you’ll be placed onto the VIP Programme, which is called the Diamond Club. There are 5 levels to the club which consist of blue, bronze, silver, gold and platinum, with each offering bigger and better bonuses. 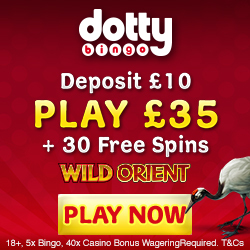 To move through the levels you simply keep playing and for every £1 on bingo or slots, you’ll earn 1 diamond. VIP member also have access to daily VIP games on top of the bonuses, cash and cards. If you have any questions or issues you can contact Farmyard Bingo via email, phone and live chat. The customer support team are available 24/7, but they also offer an extensive FAQ section for general queries. They accept the usual banking methods including credit and debit cards, Neteller and Paysafe Cards. 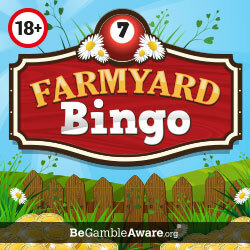 To claim a deposit bonus, simply head over to Farmyard Bingo and enjoy!